InvisaFil Thread is very fine 100 Weight 2 ply soft cottonized poly thread. 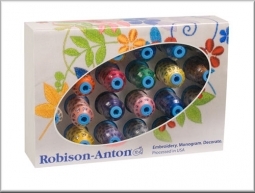 It is excellent for hand or machine quilting and applique, bobbin thread and precise piecing. 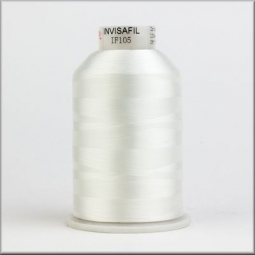 If you do NOT like the feel of monofilament, InvisaFil Thread is an excellent alternative because of its matte finish and the very fine weight disappears into fabric. 100 wt Cottonized Soft Polyester Tone on tone InvisaFil virtually disappears. InvisaFil is perfect for stitch in the ditch, Top & bottom thread, bobbin thread for delicate machine embroidery, use as top and bottom thread for couching, lace designs, hand & machine applique, quilting, longarming, and excellent for fine fabrics. InvisaFil has become a favorite with longarmers and home sewing machine owners. They love it in the bobbin with a different thread in the needle or visa versa. They also use them in the bobbin and needle at the same time. They are soft yet incredibly strong�however not strong enough to cut fabrics�and can be ironed if necessary. Being very fine and having a matte (not shiny) finish, they virtually hide on any quilt. Perfect for any quilting stitch, applique, sewing, or anywhere you don't want the thread to show.